The engineers at Elemental LED designed the Apollo in response to requests from their customers. The product is geared towards lighting designers, artists, business owners, party throwers, and anyone else who wants to create pre-programmed lighting schemes on a budget. “For seasonal or performance or artistic expression, the Apollo is a response to that customer demand for their own lighting design creation,” says JB Lowe, Customer Service Representative at Elemental LED. Step 1: Install the Apollo software onto a PC computer using the included USB stick or from elementalLED.com. Step 2: Design up to 10 lighting scenes on the PC using the software. Step 3: Connect the Apollo Controller to the computer using the included USB cable and transfer the customized lighting scenes to the Apollo Controller. 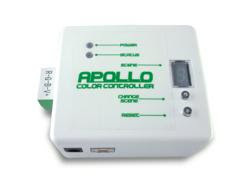 Step 4: Connect the Apollo Controller to the controllable LED lights by closely following the instructions included with the controller. Step 5: Using the buttons and the numerical display on the Apollo, trigger any of the scenes through the existing LED lighting fixtures. They will repeat until you choose a different scene or turn the unit off. The Apollo has memory, so the next time you use the unit, it will run through the last scenes loaded onto it. Shop LED Color Changing Controller for LE$$ / Price list Click here!